Daniel Humm and Will Guidara have added an extension to their much lauded restaurant The NoMad: a bar. The NoMad Bar, located next to the restaurant, is a handsome, plush space, with classic cocktails and a menu of its own. Fare includes duck sausage, pork schnitzel, and even a hot dog. Dinner nightly. 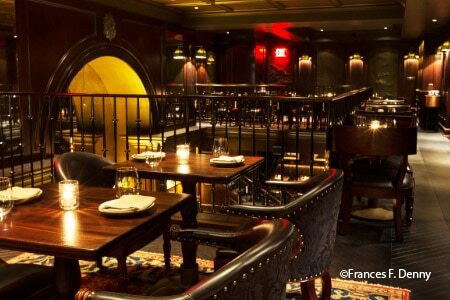 The NoMad Bar, The NoMad Hotel, 10 W. 28th St., New York, NY 10001, 212-796-1500. Chef Polo Dobkin and his wife Stephanie Lempert have launched Meadowsweet. The Williamsburg restaurant is in the space that once housed Dressler, where Dobkin was the chef. The menu's focus is modern American fare and the dining room is open for dinner nightly. 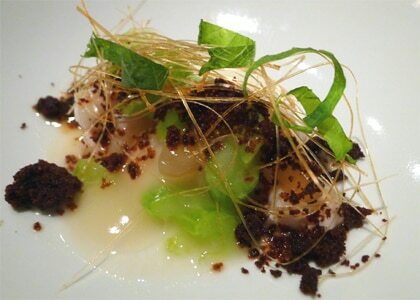 Meadowsweet, 149 Broadway, Brooklyn, NY 11211, 718-384-0673. Fields Good Chicken, a bird-centric casual eatery, has opened in the Financial District. The restaurant cooks up fowl via the grill or the oven (nothing fried here) and serves it whole, in sandwiches or in salads. Fields Good Chicken, 101 Maiden Lane, New York, NY 10038, 646-895-6831. Cherche Midi is the latest venture of restaurateur Keith McNally. The French restaurant, named after a street McNally lived on in Paris, is located in the space that housed the failed Pulino's. The chefs are Daniel Parilla and Shane McBride. Cherche Midi, 282 Bowery, New York, NY 10012, 212-226-3055. Heartwood, the Italianesque restaurant in Chelsea, has opened up an attached bar and lounge: The Parlour (note the British spelling) is a 25-seater serving cocktails and wine. Food from Heartwood can be ordered from the bar. The Parlour at Heartwood, 184 Eighth Ave., New York, NY 10011, 646-476-5458. Landhaus at The Woods is a new restaurant inside the bar and DJ venue, The Woods. The menu's focus is on American and international classics. Dishes include crab Rangoon, fish tacos, lamb burgers, and maple bacon on a stick. Landhaus, 48 S. 4th St., Brooklyn, NY 11249, 718-710-5020. Noma co-founder Claus Meyer is opening a food hall in Grand Central Station dedicated to the cuisine of Scandinavia. There will also be a brasserie serving high-end Nordic cooking. No word yet on exactly when the food emporium will debut. Pok Pok Phat Thai, chef Andy Ricker's closet-size Thai spot on the Lower East Side, will relocate in November. Ricker plans to move the restaurant closer to his other two spots in Brooklyn. Pok Pok Phat Thai, 137 Rivington St., New York, NY 10002, 212-477-1299. In Summer 2014, Le Bernardin will unveil an additional private dining space called Le Bernardin Privé. For more information, visit www.le-bernardinprive.com. Le Bernardin, The AXA Equitable Building, 155 W. 51st St., New York, NY 10019, 212-554-1515. Booker and Dax, the cocktail bar connected to David Chang's Momofuku Ssam Bar, now takes reservations --- though a majority of its tables are still reserved for walk-ins. Booker and Dax, 207 Second Ave., New York, NY 10003, 212-254-3500. Rouge Tomate, the lauded vegetarian-friendly and health-conscious restaurant in Midtown, will shut down in August and try to find a new location in downtown Manhattan. Rouge Tomate, 10 E. 60th St., New York, NY 10022, 646-237-8977. Caffe Dante, the old Italian coffeehouse in Greenwich Village, has reinvented itself. You can still spend an afternoon sipping espresso but the place now has a full menu of pizza, sandwiches, desserts and wine. The 70-seater has been open since 1915. Caffe Dante, 79 MacDougal St., New York, NY 10012, 866-681-0299. Veselka, the popular Ukrainian diner in the East Village, will celebrate its 60th anniversary by turning back the menu prices to the year it opened: 1954. Nothing on the menu will cost more than $1.60. The catch, though, is that the deal will only be available for 54 minutes and the lucky hour will be announced on the restaurant's twitter feed. Veselka, 144 Second Ave., New York, NY 10003, 212-228-9682. Avant-garde wd-50 will shut down at the end of November. Chef Wylie Dufresne announced on twitter that November 30, 2014, will be the last day for the lauded Lower East Side restaurant. wd-50, 50 Clinton St., New York, NY 10002, 212-477-2900. Le Fooding, the French culinary event of the year, is back in the Big Apple once again. In July, several meals will be offered focusing on Italian cuisine and featuring top toques. The chefs already announced are Ivan Orkin and the team behind Rockaway Taco. Check back for more details. Juni is now offering a five-course vegetarian menu at lunch only. The meal costs $50 (plus $25 if you want wine pairing) and includes dishes such as arugula soup, gnocchi with freeze-dried goat cheese, and garden peas with lemon essence. Juni, Hotel Chandler, 12 E. 31st St., New York, NY 10016, 212-995-8599. Bar Primi, the new Italian restaurant on the Bowery from chef Andrew Carmellini, is now serving lunch Monday to Friday. The menu is largely the same as at dinner but there are a few daytime novelties, such as a roast beef sandwich. Bar Primi, 325 Bowery, New York, NY 10003, 212-220-9100. The Spotted Pig's porcine mascot, which has hung above the door of the West Village gastropub since it first opened in 2004, has been stolen. No culprits have come forward but security camera tape is being looked at in the hope of finding the pig stealer. The Spotted Pig, 314 W. 11th St., New York, NY 10014, 212-620-0393. Marcus Jernmark, the chef who took over Aquavit after Marcus Samuelsson's departure, has left the restaurant after four years in the kitchen. The restaurant's pastry chef, Emma Bengtsson, has been named the new executive chef. Aquavit, 65 E. 55th St., New York, NY 10022, 212-307-7311. Dan Kluger, chef at Jean-Georges Vongerichten’s ABC Kitchen and ABC Cocina, is leaving those restaurants to open up and run one of his own. ABC Kitchen, ABC Carpet & Home, 35 E. 18th St. , New York, NY 10003, 212-475-5829. Mole, the Mexican restaurant on the Lower East Side that spawned a couple additional outposts in New York City, has shut down. The other locations of Mole remain open. Mole, 205 Allen St., New York, NY 10002, no phone. Gabe Stulman will close Chez Sardine, his Japanese-esque restaurant on the corner of W. 4th and W. 10th Streets, on July 6. It will reopen two weeks later as Bar Sardine and will have a new menu of bar food. Chez Sardine, 183 W. 10th St., New York, NY 10014, 646-360-3705. Union Square Cafe, Danny Meyer's once-pioneering restaurant that has been open almost 30 years, will close when its lease expires at the end of next year. It will seek a new location with a more affordable rent. Union Square Cafe, 21 E. 16th St., New York, NY 10003, 212-243-4020. McCormick & Schmick's Seafood’s only Big Apple location has shut down. McCormick & Schmick's Seafood, 1285 Ave. of the Americas, New York, NY 10019, 212-459-1222. Vic & Anthony's, the national chain of steakhouses, has closed its only New York City outpost: the restaurant on Park Avenue in Gramercy Park. Vic & Anthony's Steakhouse, 233 Park Ave. S., New York, NY 10003, 212-220-9200. Harlem poultry-focused restaurant Mountain Bird has closed. Its owner and chef, Kenichi Tajima, hopes to find a new location. Mountain Bird, 231 W. 145th St., New York, NY 10039, no phone. After 15 years in business, the original Sushi Samba, located on Park Avenue, is closing for good at the end of June. The spin-off restaurant, SUSHISAMBA 7 in the West Village, will remain open. In the meantime, the Sushi Samba on Park Avenue will be offering a 25 percent discount on wine bottles every Wednesday until it closes. Sushi Samba, 245 Park Ave. S., New York, NY 10003, 212-475-9377.